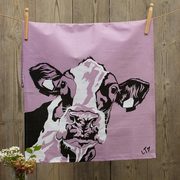 Two curious dairy cows to help you with the washing up! Molly the inquisitive friesian, and sunshine yellow Ruby. A lovely pair of ladies to add a burst of colour to your home.